Due to a last minute schedule change, the Prior Lake-Spring Lake Watershed District has an opportunity to remove some obstructions on the bottom of Crystal Bay TODAY (Oct 8th) in anticipation of a future carp seine (removal) at this location. The District has seen carp group up in this bay multiple times over the last three years, but obstructions on the bottom have prevented any efforts to remove them. The planned obstruction removals for later today will help the District take advantage of the carps’ migratory behavior and aggregations in this bay, and will advance the carp management plan for Prior Lake. Jeff Riedemann, the commercial fisherman engaged for this project, will be running a chain along the bottom of the bay, concentrating on the southwest side where carp have grouped up in the past. When they hit a “snag”, they will be pulling the obstruction up and moving it to a different location in the bay that is further away from the potential seine area. Will any tree branches or debris be removed from the lake? 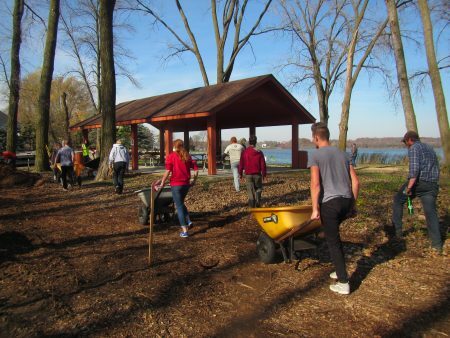 Since there are zebra mussels (an invasive species) in Prior Lake, the debris will not be removed from the lake to minimize any risk of moving this species to uninfested waters. Leaving woody debris on the bottom of the lake is also beneficial to macroinvertebrates and fish. Are carp going to be removed from the lake today? At this time, we do not anticipate that any carp will be removed during the obstruction removals. However, if a large congregation of carp are present in the bay, the commercial fisherman may temporarily trap them with nets in the location to hold them there until preparations can be made for their removal. With Crystal Bay cleared of obstructions, this provides the District with another potential area to seine (remove) carp in Prior Lake. 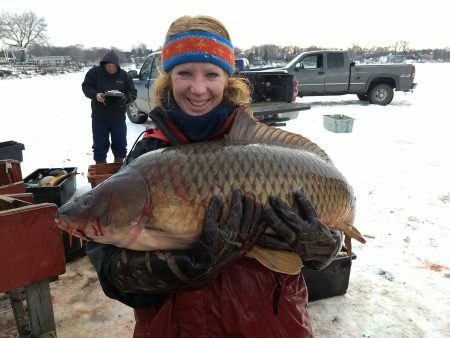 Later this fall and winter, the District will take opportunities as they arise to remove additional carp from Prior Lake. These efforts are part of a comprehensive approach to manage carp populations. More information can be found by clicking here: Integrated Pest Management Plan for Carp. If you have any questions, please feel free to contact me or check out our carp management website page at: https://www.plslwd.org/projects-and-programs/projects/carp-management/. What did PLSLWD do in 2017? Check out our 2017 Annual Report! The 2017 Annual Report is out! What to know what the District accomplished in 2017? Check out the report for a rundown of the District’s 2017 programs, projects, and everything else. You can also find a sneak preview of what’s in the works for 2018! The report can be found on our District Reports page. P.S. Lest you dismiss this as boring, we promise the report is easy for the average citizen to read and includes some nice pictures too! Upcoming Carp Seine on Upper Prior Lake! UPDATE: (Jan 22nd, 9:00 am) The fishermen returned on Saturday, finished pulling out the rest of the carp and shipped them off to market. The preliminary final total was 35,000 pounds (17 tons) of carp removed. There were roughly 3,000 carp removed which is estimated to be just under 20% of the Upper Prior carp population. Update: (Jan 19th, 3:00 pm) The fishermen were back today and pulled out 20,000 lbs of live carp, filling up a tanker semi-truck to send off to a market in New York. We also radio-tagged two additional carp, which we released back into the lake. The fishing crew will be back out again tomorrow morning to pull out the rest of the fish. They’ll probably be there around 8 or 9:00 Saturday morning until lunchtime or so, depending on how fast things go. Once again, feel free to swing by to check out the action! Parking available at the Knotty Oar Marina. Update: (Jan 18th, 6:00 pm) The fishermen finished pulling the net with the carp into the hole this afternoon. It looks like it will be a pretty big haul!! They’ll be back out tomorrow morning (Friday) around 9:00 am to pull out the fish, weigh and load them on the truck to ship off to market. Feel free to swing by to check out the action! Parking is available at the Knotty Oar Marina. Update: (Jan 18th, 2 pm) The fishermen have the carp netted up and are working on pulling them in. 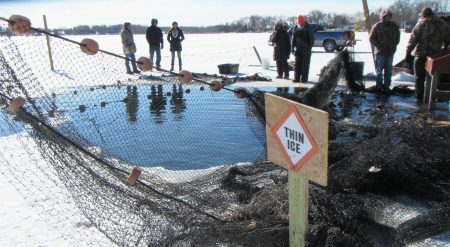 If things go well, hopefully they’ll have to carp pulled to the take-out hole in the ice sometime around 3:00 pm or so. They’ll be separating out the native fish today and returning them to the lake. Tomorrow they will be back to take the fish out and do any sorting as necessary. 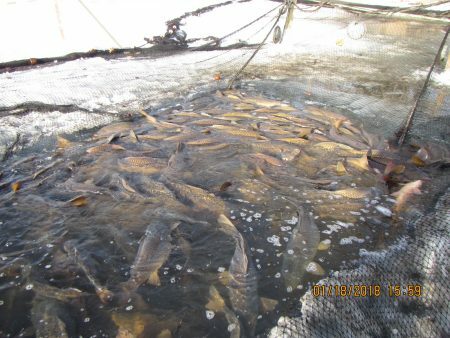 The Prior Lake-Spring Lake Watershed District has located a group of carp on the north side of Upper Prior Lake to the west of Knotty Oar Marina. A potential winter seine effort (netting and removal of the carp) will target this group of fish. 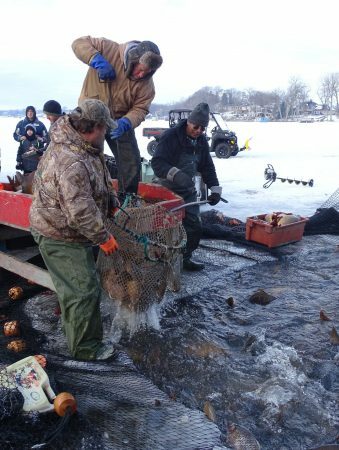 If conditions remain favorable TOMORROW (Thursday, January 18th) and the carp continue to remain aggregated at this location, a large hole will be cut into the ice to enable the removal of carp. For safety purposes, please use caution around the hole. Orange snow fencing, yellow flagging, and/or signs will be placed around the area to alert any passerby. Native to Europe and Asia, common carp outcompete the native fish in our lakes. Muddying up our waters with their bottom feeding habits, carp are stirring up the bottom of our lakes, releasing phosphorus back into the water which in turn feeds the algae, increasing the potential for algae blooms throughout the summer. The Prior Lake-Spring Lake Watershed District is using an innovative method to locate and remove a significant portion of the carp in Spring and Prior Lakes. A total of 26 common carp have been surgically implanted with radio tags and released back into Spring and Prior Lakes . These tagged carp work as spies, sending signals out to a receiver device, allowing the District to track the movement of the fish throughout the three lakes and connecting channels. When the fish begin to cluster together, the District will strategically work to catch and remove the groups of carp from the lakes. The carp location information will also help the District identify the areas the carp are using to spawn. Fish barriers will then be installed to block the carp from entering these spawning areas, ultimately reducing their overall population growth. Although controlling the carp on the lakes will substantially improve the water quality, it is only one of the many tools that the District is using to keep our lakes as clean and healthy as possible. This project will address the phosphorous already in the lakes, while ongoing District projects reduce the phosphorus entering the lakes each year through runoff. 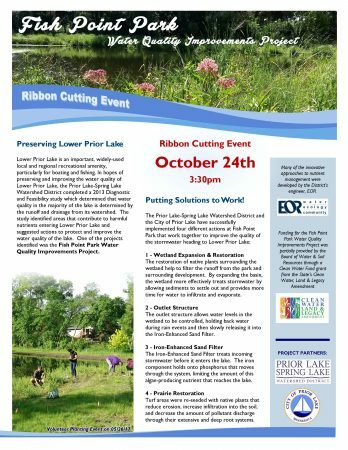 All these efforts work together to improve the water quality of Upper Prior Lake. Interested in helping out or coming out to see the carp removal? Residents that are interested are welcome to join the PLSLWD out on the ice as we remove the carp from the lake. There may also be some opportunities for volunteers to assist in the process, such as sorting the fish or taking photos of the event. If you would like to receive carp updates or more information on the upcoming or future seine events, please contact the PLSLWD at kkeller-miller@plslwd.org. For more information about the PLSLWD’s carp management program, please click here: Carp Management.